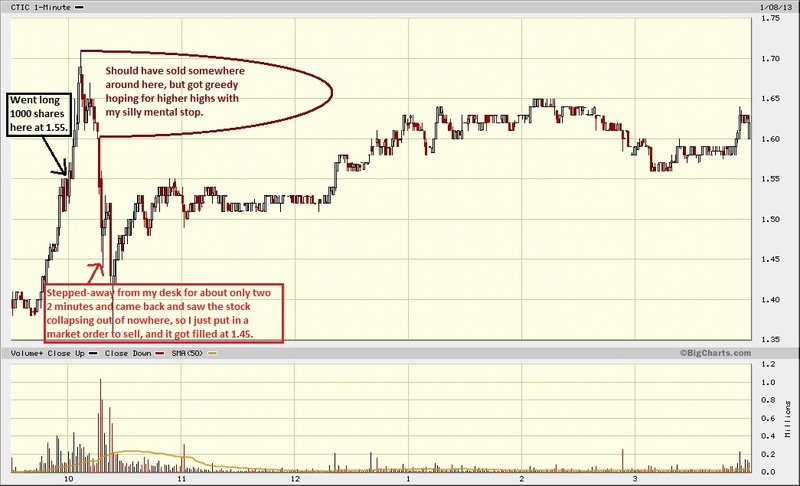 TRADER 9: Trade of the day, CTIC!!! My trade of the day is usually a winning trade, but today I want to show you why mental stops are wrong if you ever get up from your trading desk. Went long 1000 shares on CTIC at 1.55 when it had some very high volume, and looking like it was heading straight upwards to 2 dollars a share. I put in a mental stop knowing this was going to be a brief trade. Now the minute I thought it was okay to step away from my desk to look for some whiteout, I could see the stock starting to collapse from a distance on my computer monitor. So the time I got my mouse and placed a market sell order, it was already almost down more than 10%. I put in the market order and sold it at 1.45 for a .10 point loss. Always remember to put in place a stop order if you ever step away from your computer. If you want to see what I might be trading during market hours and interact with me during my trading days, just follow me on stocktwits or twitter @tradermike9. yeah that was a quick downturn on that stock this morning after the quick run up. I never really ever remembering a Nasdaq dropping down so quickly back to its' lows after a nice huge upward move like that. As usual again the stock does end up going higher throughout the day without me. Mike can you explain why you only took 1000 shares on a $1.55 stock, CTIC, while other times you put more money at risk, ie 1000 shares of a stock at $15. Was it the sketchiness of CTIC? Did you have other plays going on? Short on time today? thanks! If you look carefully at my previous trades, I only put 1000 share blocks on most (expect VRNG, DVAX, and ONTY) of my trades that are trading over a dollar a share. Now if the total price of the stock gets to over $10,000 when I'am trying to buy 1000 shares, then I'll buy less than that. Rarely do I buy over 1000 shares on any stock over a $1 a share that I've not traded before. And I have not traded CTIC before, but have traded VRNG and other stocks before were I'm comfortable putting in more than 1000 shares because I know how they swing throughout the trading day. In other words, stocks I have traded on a consistent basis between the prices of 1-10 dollars a share I will most likely buy 1000 shares, but stocks I have never traded before in my life, like CTIC, I will never put in more than 1000 shares.